Nothing helps you realize what’s best in your life until you try it’s terrible, terrible counterpart (of sorts). I tried new foundations and kept going back to the Kat Von D Lock-It Foundation. I’m convinced now that it really is that good. Go to Sephora stat and get a sample to try, and tell them you want a week’s worth because you’re worth it but really because you know your paycheck could go to Sephora in one fell swoop. According to the Kat Von D website, the foundation is part of their #veganalert product line, and I believe their entire brand is cruelty-free. I bought mine from Sephora. You can’t tell in the picture above but that bottle of serum is empty to the last drop. I literally pulled it out of the trash for you guys (you’re welcome). I alternate the use of this serum with my rosehip oil every night. The reason I love this serum so much is that I can truly tell the difference in my skin the next morning when I didn’t use it. While I would 100% buy this again, I’m too much of a “need for change” type of girl, and want to try a new serum. Any recommendations? According to ethicalelephant, Acure is a cruelty-free brand, but not all of their products are vegan (the CGF oil-free serum happens to be): Acure Organics is certified cruelty-free by Leaping Bunny and PETA Beauty Without Bunny Program. This ensures Acure Organics products and ingredients are not tested on animalsduring any stage of product development and manufacturing. Acure Organics also does not sell in foreign markets that require animal testing by law. I bought mine at Fresh Thyme but you can buy it on the Vitamin Shoppe as well, and select Target locations. According to the Fresh website, the entire brand is cruelty-free (woop woop): As a result, all Fresh products undergo very strict tolerance tests using non-animal methods during the development of each product to ensure quality and safety prior to market. However, ethicalelephant found otherwise, so I’ll leave it to you to make that decision. I bought mine last year at Sephora. After a looooooong day, what’s better than some cuddles, Netflix, wine and maybe a bath? I love how these Asili Naturals bath bombs smell (so subtle and not overly fragrant) and best of all, I can definitely feel softer skin. I made hand soap out of the lavender bath bomb one and lurv it. You can order them on the Asili Naturals site and in select stores throughout Wisconsin. I wasn’t sure which category this should go under so it got it’s own. While I’m not 100% if this is vegan, I know with certainty that it is 100% vegetarian (and most aren’t! ), according to their site. My uncle-in-law (??) gave this to me, and I used it a couple of times (and I will probably leave it for guests to use because I am uncertain if it’s VCF), but if you are transitioning to a vegan lifestyle, and can’t find a vegan toothpaste you like, the Herbodent toothpaste might be the perfect stepping stone. You can buy it on Amazon. What is your favorite VCF serum? What would you recommend? What were your February favorites? If you love the idea of taking baths but don’t have a bath tub fit for a queen like you, or want to enjoy your bath bomb without having to take a bath because some of use just don’t have the time to luxuriate (hi! )…then this SUPER EASY DIY is for you! I’m completely devoid of the DIY gene so the fact that I can even do this says something. Without having to film, this would’ve taken me like 5 minutes to do. Watch the video to find out how to turn your favorite bath bomb into shower gel. No surprise that I used one from Asili Naturals, but you can use any you have. NOTE: One thing I would do after mixing, is to let the solution settle for up to an hour before pouring into your bottle. Enjoy! How else do you use your bath bombs? Do you get creative? We all know about my undying love for Asili Naturals. With that said, it was time to see if that love extends to their bath bombs. Once you drop it in the water, it fizzes and fills your room with the scent of pumpkin spice essential oil (move over PSLs!). It creates a good amount of bubbles and well, just feels natural you know? Price: $3.00 for 1.85 oz. Now, I’ve always liked the way Lush products look. This one in particular looks like a carved pumpkin, I mean come on s’ cute. But the con I have with Lush bath bombs (which is kind of also a pro) is that they’re so darn crumbly and hard. I could clearly use this one for multiple baths but how do you cut it exactly in half or a quarter and save the rest? I’ll leave that to my bath aficionados. Price: $7.75 for 7.0 oz. The Whole Foods Fizzing Bath Bomb is a fun and effervescent, yet all-natural way, to get your relax on in the bath tub. It feels soothing and fizzes nicely when you place it into the tub. The one downside though is that it didn’t create many bubbles (maybe I picked the one sad bath bomb and it wasn’t bubbly enough? ), but the scent was still amazing. As far as ingredient quality goes, it has 9 ingredients and none of that Orange 5 or Sky Blue 4 in it. All natural for the most part. Price: $3.00 for 2.3 oz. Tie between Asili Naturals and Whole Foods! I would say Asili Naturals won by a thread because of their ingredients and product quality but Whole Foods is just a hair behind. The cost for quality is great for both, but I know exactly what I’m getting with Asili Naturals products AND I’m supporting a woman-owned business instead of a corporation which is always a thumbs up in my book. 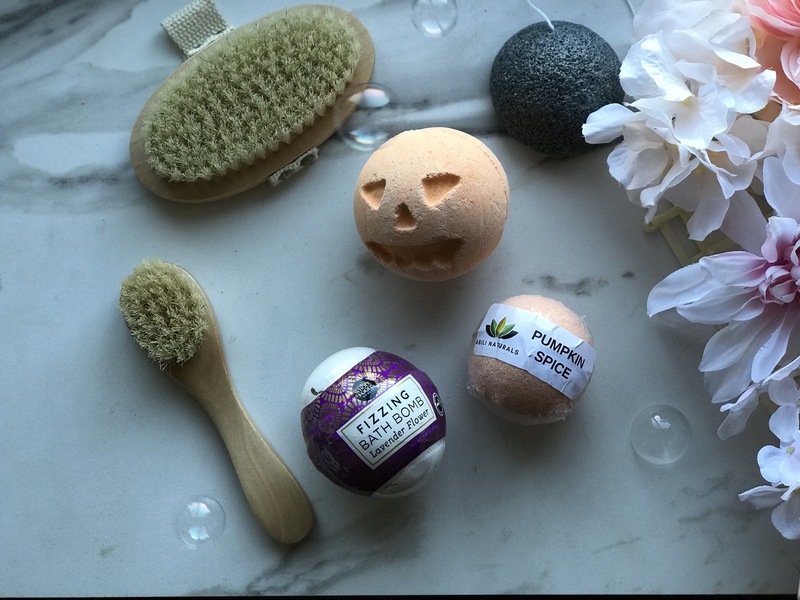 What are your fave bath bombs? What is your favorite part of your self care routine? Do share!